In tandem with the presidential election and the Dublin West by-election, the government set two referenda to be held on 27 October 2011, both relating to legal issues. One, on the remuneration of judges, passed by a large margin as was expected. 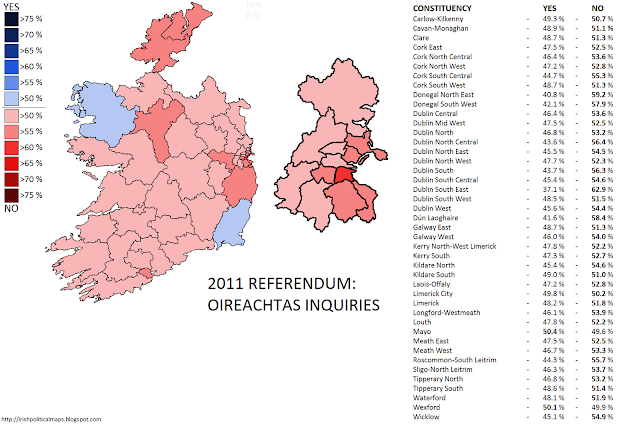 The other referendum concerned Oireachtas inquiries, and generated considerable more controversy than its partner. The latter referendum, the Thirtieth Amendement of the Constitution Act (2011), sought to grant the Oireachtas more powers to conduct inquiries in to "matters of public importance". It was inspired after the killing a decade previous of John Carthy after a seige with Gardaí. The Oireachtas set up the Barr Tribunal to investigate the incident, at an eventual cost of €18 million. It was considered that Oireachtas inquiries would save expense and delay (the Barr Tribunal report being published after sitting for three years). Due to the intense media coverage surrounding the presidential election, little attention was focused on these referenda until the last few weeks leading up to polling day. Popular opinion appeared to lean towards passing both referenda until a sustained campaign by the Irish Council for Civil Liberties garnered considerable media attention. The ICCL warned that the bill, if passed, would establish "kangaroo courts" and that the citizen's right to a good name was under threat. Subsequent to this, an intervention by eight former Attorneys General also brought the bills to the forefront of public attention. An open letter was published in the main newspapers, signed by Patrick Connolly (Haughey 1982), Peter Sutherland (FitzGerald 1981-2, 82-4), John Rogers (FitzGerald 1984-7), Harry Whelehan (Haughey/Reynolds 1991-4), Dermot Gleeson (Bruton 1994-7), David Byrne (Ahern 1997-9), Michael McDowell (Ahern 1999-2002) and Paul Gallagher (Ahern/Cowen 2007-11). On the Oireachtas inquiries referendum, the men agreed with the ICCL in arguing that the bill, if passed, would grant the Oireachtas too much investigative power at the expense of citizens' rights. Justice Minister Alan Shatter denied these claims and dismissed the men as having their own motives for speaking out. Nevertheless, the campaigns against the referenda had a profound effect, as shown by opinion polls. On 8 October, an Irish Times poll found that 65% would pass the referendum, 8% would not and 27% abstained. Just over two weeks later on 25 October, shortly after the publication of the letter, a similar poll saw support declining, with 57% in favour, 20% against and 23% undecided. The actual result revealed that the electorate had decided against the bill, though on a rather narrow margin in many constituencies. Only in two did it pass: the Taoiseach Enda Kenny's home county, Mayo and Public Expenditure Minister Brendan Howlin's Wexford. The highest vote against the bill came in Dublin South East, where 62.9% voted against it. Even in Longford-Westmeath, where the so-called Abbeylara Incident took place, the bill was defeated by 7%. This result came as a stark contrast to the other referendum, which passed by a large margin. Combined with Fine Gael's losses in the presidential and Dublin West elections, the bill's defeat was considered a blow for the government and particularly for Justice Minister Alan Shatter. The long-term effects of the result remain to be seen.